Honda officially launches the CBR150R and announces its price for India..
After unveiling it in the 2012 New Delhi AutoExpo and announing that the CBR150R would make it to India by early 2012, Honda has kept it's word and has now officially launched the bike. Unlike the CBR250R which has been positioned as a "Mini Sports Tourer", Honda seems to be positioning the CBR150R as a "Mini Track bike". Priced at Rs. Rs 1,16,385 (ex-showroom Delhi) for the Standard and Rs. 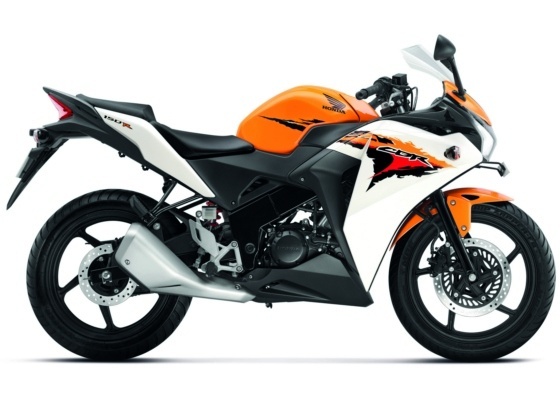 1,17,385 (ex-showroom Delhi) for the Deluxe variant, the CBR150R is pegged at about Rs. 10,000 dearer than its closest rival in terms of specs and body style, the Yamaha R15 Version 2.0. On the other hand it is priced almost at the same price of the KTM 200 Duke. Also unlike the CBR250R, there is no ABS variant for the CBR150R. Dimensionally the CBR150R is almost identical to the CBR250R and apart from the different color combinations it would take an enthusiasts keen eye to make out the difference between the two. Personally the CBR150R appears more proportional, thanks to the shorter exhaust and the perimeter frame like element of the chasis of the CBR150R. I hope that the CBR150R is better than the CBR250R in the fit and finish department (the finish of parts on the CBR250R leaves a lot to be desired from a bike which costs Rs. 1.6-1.85 lakhs on road) although it be odd as the CBR250R is the costlier one. But lets see..
On paper the specs and features of the Honda CBR150R seems to be quite similar to the Yamaha R15 Version 2.0. With a specs list of a 4 valve, liquid cooled, fuel injected engine, 6 gears, monoshock rear suspension, and a sporty frame both bikes seem neck to neck in terms of performance. It would take a real world test ride to evaluate how the CBR150R actually feels to ride on the road. With the CBR150R there is now another addition to the growing "Premium Commuter" list in India. I am expecting the CBR150R to not only take away a slice of the R15 Version 2.0's share but also from it's elder brother the CBR250R..!! But in terms of a mouth watering combination of pure "on road performance" and a wallet friendly "value for money" proposition, the soon to be launched Pulsar 200NS appears to be a more exciting.. unless of course a "full fairing" and/or "fuel injection" is in the must have list. On the other hand the racy and gloriously naked KTM 200 Duke is also available at the same price as the honda CBR150R. With such potent competition and top quality options available to the Indian public, the CBR150R might just find the going a tad tough. What do you think? Grossly overpriced. Atleast the competition makes it feel so. But Honda brand might do some favor..
R15 has got its loyal costumers thanks to superbike-on-150cubes feel. Hope new CBR 150 is no different. @above, thanks for point that out bro.. have got it corrected. My opinion - Pulsar 200 NS 'seems' like a mouth watering option on paper, but in reality, it isn't. Also, I don't think the CBR150 will take away too many customers away from CBR250R because I believe that customers of CBR250R are making their choice based on the right reasons. The Yamaha R15 V2.0 is a nice bike though, and it will be very difficult for Honda to compete with it. Yes on paper the Pulsar 200NS does seem impressive.. but even dynamically the new Pulsar has impressed everyone who have got to ride it so far. The new Pulsar seems to be even more refined than the 200 Duke (!!) and its handling seems to be very very impressive. In fact Autocar India (one of the auto mags with the most fair reviews) has rated the new Pulsar 9/10 in its Mar 2012 issue..!! I would say that we just can't just write off a 200 cc, Liquid cooled, 4 valve engine which shares its development history with a KTM (200 Duke) and a proper "Perimeter Frame", that too even without riding it. No engine kill switch & no sign of ignition shutter lock like the international version of CBR150R..
Honda trying to cheat us with such high price tag..
Hello, any news of yamaha fazer 250cc?? quite honestly feel that the cbr will do wonders for the Indian market..the r15 has been top of the line for a while especially with the version 2.0 but i feel the cbr will outdo Yamaha's pride. The whole comparison shows clearly that the cbr has taken the r15 by a small margin. Definitely a force to be reckoned with. I am planning to buy yamaha R15 or CBR, can anyone please suggest me, which one is the best? Brother, the cbr150 is having a low torgue compared to yzfr15 2.0 although the bhp is more in cbr150...is this going to have a problem for riding in hilly areas with pillion?plz comment. On inclines and on hilly areas, more torque is appreciated. On paper it seems that the CBR150R has to be revved to get the most out of that engine. thanks for the comments above on my question...much appreciated. Bro...when will u get a road test for this bike? Really looking forward to your test drive of the CBR150R. Everybody just starts to become an expert after seeing the numbers on paper, the CBR 150 is a very good "sports bike" it has excellent handling than the V2 at higher speeds and obviously better top speed, its engine is more advanced than V2 with PGM-fi(more mileage) system. The queer this is no pass light and ignition kill switch, which turned off many, and why should we pay Rs6000 more for a 150cc, its not the same as V2 until u have ridden it. If you can ignore the kill switches, then its a pretty good bike to ravish on. I ve ridden the standard CBR 150 its a mean machine above 7000rpm. Its a full fairing "sports bike" go for it.